Posted on Friday, October 12th, 2018 at 10:59 am. This Sunday, October 14th is National Dessert Day. Here in the Livermore Valley, we believe the best way to celebrate National Dessert Day is with a perfectly paired wine. Below are a handful of creative and decadent ideas to get you thinking about how to spend your weekend celebrating! Big White House Winery has a wonderful pairing with their 2013 Late Harvest Syrah ($36) and Poached Pears. It takes a little attention, but is a actually a simple recipe; just core the pear and simmer it in the wine with some whole allspice, clove and cinnamon. After the pears are poached, reduce the wine just until it starts to thicken. This fruit forward dessert also pairs well with the Late Harvest Viognier, since it has a pear character on its own. 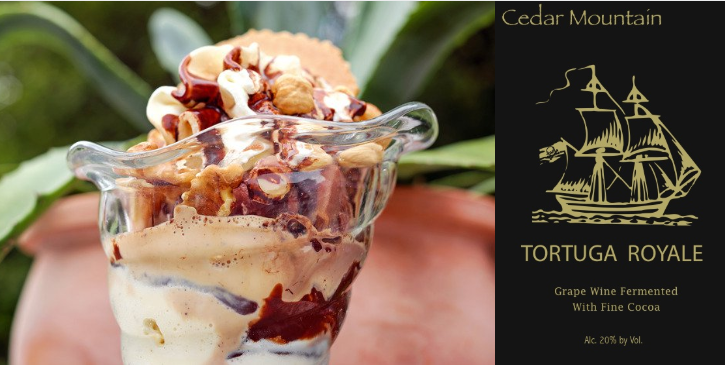 Cedar Mountain Winery makes it really easy for you to have a delicious dessert. It’s called an “Adult Sundae”. For chocolate lovers, start with your favorite chocolate ice cream in a bowl. Pour some Cedar Mountain Tortuga Royale Port ($28) over it. Top the sundae with some whipped cream, dark chocolate sprinkles and a Maraschino cherry. Serve with a glass of Tortuga Royale on the side. Or, if you prefer vanilla ice cream, pour some Cedar Mountain Luana Inu Port ($28) over the ice cream and top it with whipped cream and a Maraschino cherry. When in season, fresh peaches along side the ice cream compliment the “peachy” Luna Inu port. Serve with a glass of Luana Inu on the side. Oozing rich dark chocolate and a well-aged, full-bodied port punctuates your dinner with decadence and style. The Charles R Vineyards brownie recipe makes creating this dessert easy. Use any brownie recipe and replace the water with the the Gold Medal winning, 2009 Vino de Amor Reserve Tawny Port. Cover your brownie in hot dark chocolate sauce and add a few raspberries for a punch of color and flavor. This Portuguese style Port enhances the rich flavors of the brownie, while the brownie softens the port to delight your pallet. 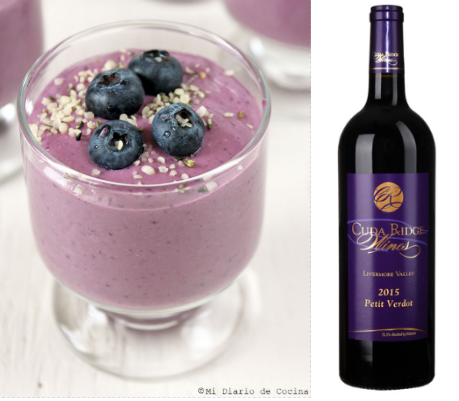 Cuda Ridge offers a unique, and scrumptious, dessert pairing with Cuda Ridge 2015 Petit Verdot ($38). The combo includes their award-winning wine and Blueberry Mouse! This mousse involves whipped cream cheese with blueberry puree, topped with whipped mascarpone cheese and dark chocolate chips. There are many ways to create this dessert on your own. Check out the feature on Mi Diario de Cocina for a simple recipe under 40 minutes. 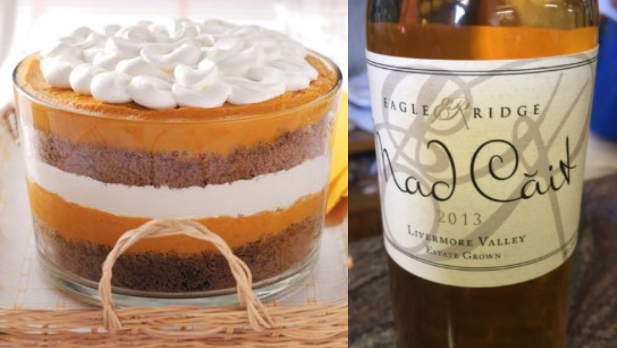 The perfect pairing at Eagle Ridge Vineyard is a Pumpkin-Gingerbread Trifle with the 2013 Pinot Grigio “MadCait” Angelica Dessert Wine ($29.00).The Pumpkin-Gingerbread Trifle is a not-too-sweet dessert with pronounced pumpkin and spiciness from the gingerbread, softened by creamy whipped cream. These three flavor profiles are complimented by the sweet/fruitiness of the “MadCait”. Overall, you know you’ve had dessert, but it is not cloyingly sweet. It makes one think you can have a little bit more, until you do! A great recipe for this dessert can be found on the Taste of Home blog post, Pumpkin Gingerbread Trifle. Ehrenberg Cellars has a dessert recipe all their own, A Dessert Wine Berry Cobbler. The secret to this indulgent dessert is soaking blueberries, cherries and strawberries in their 2014 ETC Dessert Wine for 2 hours. Then, lightly strain the fruit and use it in any cobbler or crisp recipe! Fenestra Winery has a delicious 2015 Riesling, Arroyo Seco ($19) that pairs beautifully with a fresh slice of Lemon Cheese Cake. The pair go well together because of the aromas and notes of orchard fruits like nectarine, apricot, honey-crisp apple, and pear that compliment the acidity of the Lemon Cheesecake. 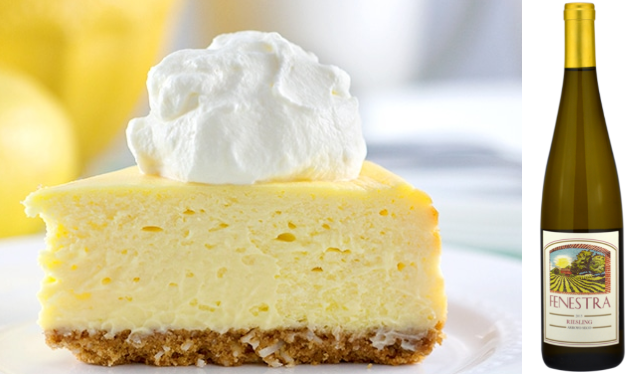 You can find a nice recipe to make a Lemon Cheesecake via The Unlikely Baker Blog, here. McGrail Vineyards & Winery’s 2014 Charlie Rae Chardonnay is a butter bomb of a Chardonnay. While this wine is heavy on the butter, it certainly does not lack the fruit characteristics of a great California Chardonnay. Lemon, apricot, coconut, banana, and cantaloupe melon are some of the fruit notes that can be found in this wine. 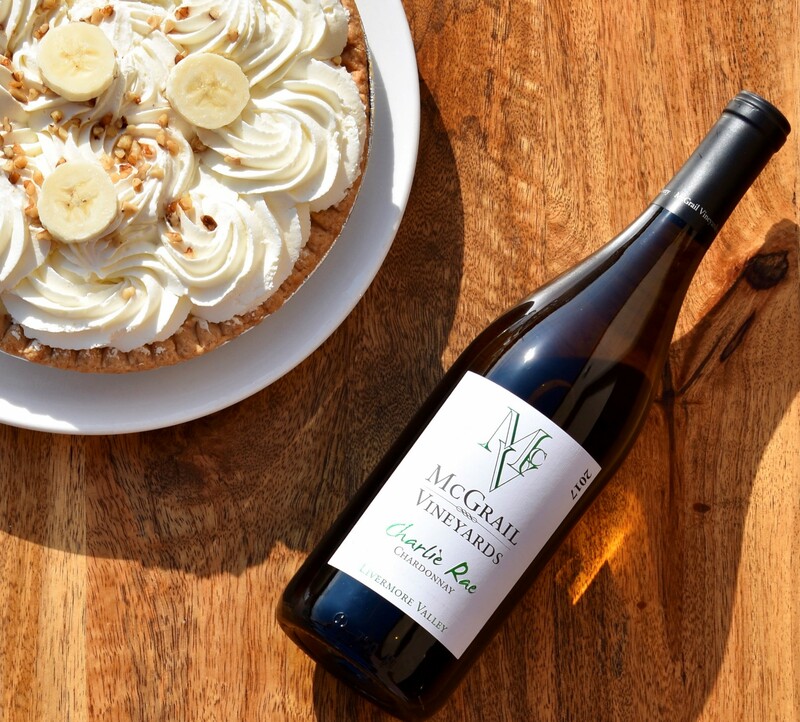 Comparable to our Chardonnay, banana cream pie has plenty of cream, butter, and, of course, banana. Its buttery crust and whipped cream topping match the abundance of butter and cream in the wine. The tropical fruit notes in the Charlie Rae pair perfectly with the creamy banana in the pie. Find a great Banana Cream Pie recipe on the blog Cincy Shopper, here. McKahn Family Cellars takes both wine and chocolate seriously, because they are self-proclaimed oenophiles and chocoholics. One of their most recent releases is their 2016 Petite Sirah ($42) . They wanted to make this release special, so they had a local chocolatier infuse their Petite Sirah into a dark chocolate truffle to pair with the wine. 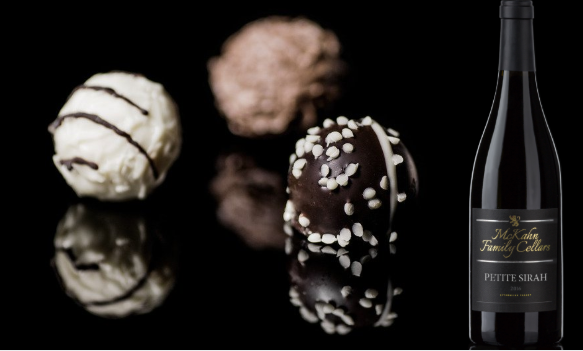 Pairing this wine with your own chocolate comes close to this creation! A dark truffle that is not too bitter is the perfect pairing to smooth out the tannins and highlight the berry fruit notes. 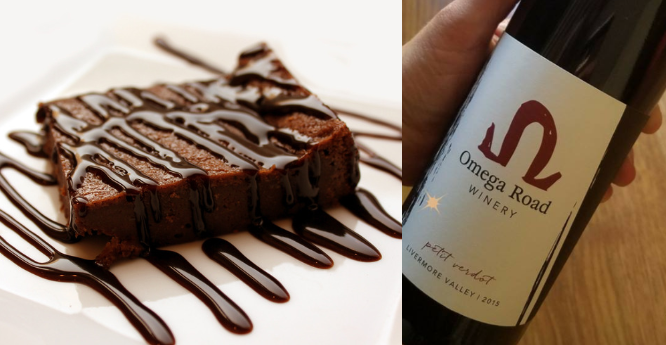 Omega Road Winery has a decadent 2015 Livermore Petit Verdot that pairs perfectly with a simple, Chocolate Fudge Brownie. The wine is vibrant, full of fruit and floral impressions, along with stunning savory sage. The complex cocoa and tobacco notes complement the richness of a warm Chocolate Fudge Brownie. Fudge Brownies can be recreated in a handful of different ways, but check out one of our favorites on Yammie’s Noshery blog found here. 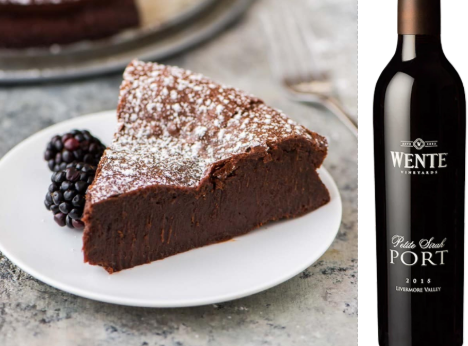 Wente Vineyards pairs their 2016 Petite Sirah Port ($35) with a delicious, gluten-free Chocolate Flourless Cake. Flavors reminiscent of blackberry pie, ripe black cherries and dark chocolate are complemented by nuances of coffee bean, spice, and vanilla bean, making all the features of the cake stand out. You can find a delicious Chocolate Flourless Cake recipe on Well Plated, here. 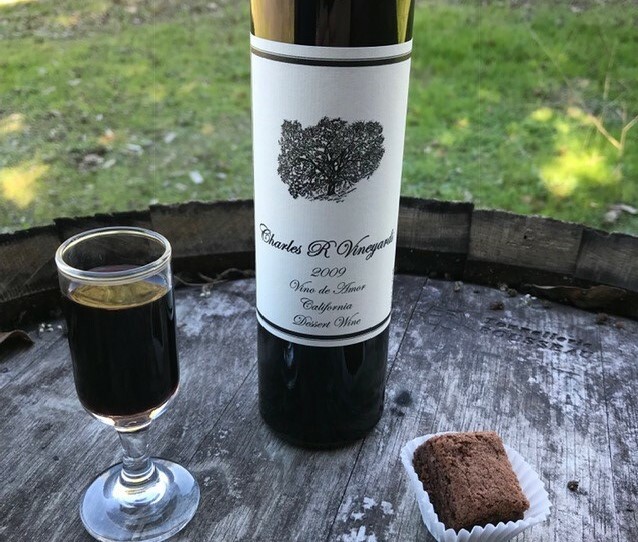 Wood Family Vineyards paired up with Maria Terry of La Sommelierre to perfectly combine their 2016 ‘Muy Bueno’ Zinfandel ($34) with a sweet and savory dessert. This is an intensely aromatic, fruit-forward Zinfandel that has a perfect balance of acid and sugar making it a great partner for these slightly sweet, smoky crackers. 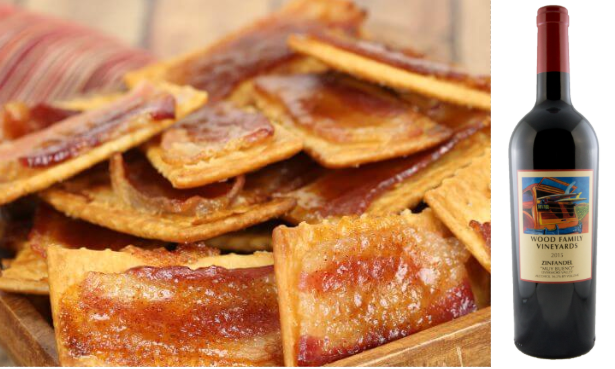 The salty, smoky bacon brings out the fresh fruit flavors in the wine. These crunchy little bites are a lovely way to end a meal and would be a welcome addition to an end of the meal cheese plate featuring strong, soft cheeses. Find an incredible recipe here. We hope you all have a great National Dessert Day! Stop by all these incredible wineries to visit their tasting rooms and learn more about the history.